The 2016 winners, Wicklow RFC, won the Cup for the first time in the club’s history beating the heavy favourites Enniscorthy in the final. In the lead up to the final, Wicklow was gripped by rugby fervour. The whole town was decked out in the club’s colours of red, white, and black. Bunting and flags were visible on every street. When they brought the trophy home after their win, the celebrations went on long into the night. Wicklow’s victory was the culmination of many years of hard work by volunteers, coaches and officials at the club. Founded in 1963, the club initially depended on the generosity of local landowners for playing and training facilities. 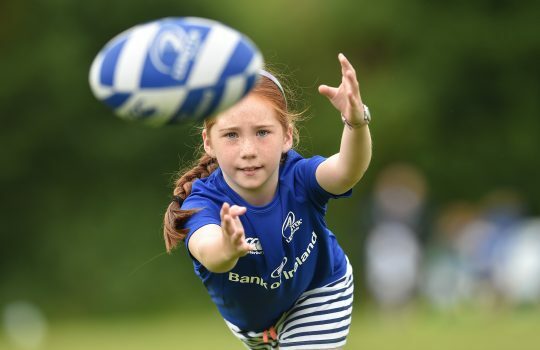 Since then, Wicklow has developed into a club that now has over 500 registered players. It proudly fields two senior men’s teams; 10 juvenile teams; girls’ teams at under-12, under-15 and under-18; and a ladies team. Club president, Larry Byrne, who works locally as a motor mechanic, has been associated with the club since 1979. He believes that Wicklow’s success is down to the work of the grassroots. Support for Wicklow RFC in the local community. Timmy O’Donovan, who played loosehead prop in the men’s senior team that won the cup, is full of praise for the training setup, particularly at underage level. Dennis Higgins began playing rugby with Wicklow at under-7 over twenty years ago. 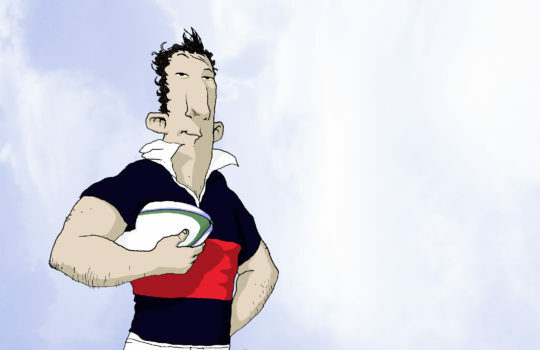 He played scrumhalf on the team that won the Provincial Towns Cup. Boyz 2 Men, a local Wicklow barber shop, trimmed out in Wicklow RFCcolours. Former captain of the first team Ciaran Billington operates a coffee shop in the town-centre. For him, winning the Provincial Towns Cup is something he will never forget. Ciaran is a busy man, but manages to find enough time to train the under-5 Minis. He believes that youth development is critical. Stephen Clarke, a former player and current public relation officer, is adamant about the spirit of the club. Local butcher’s shop proudly supporting Wicklow RFC. Recently Wicklow achieved another of its long term goals when its senior ladies team began to play in the Leinster League Division 3. It’s the result of many years of development of girls’ rugby at the club. In 2013 the Wicklow ladies and under-18 teams were the first female rugby teams to tour outside Ireland when they undertook a tour to Wales. Building on the success of that tour, the Wicklow girls in August 2016 became the first Irish female rugby team to tour outside of Europe when they played three teams in Canada. The club will continue to train boys and girls, and to develop their senior teams. It will always strive to bring people together and to enrich the sporting life of the locality. The sense of community and commitment endures, and is embodied in the spirit of Wicklow RFC. 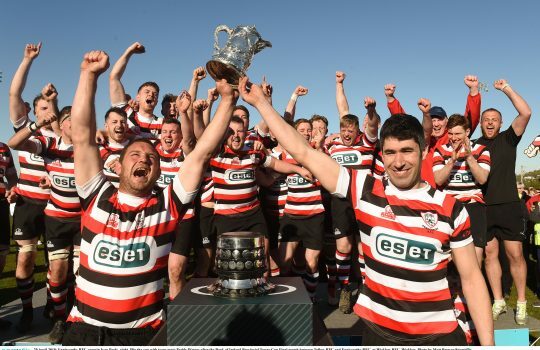 Wicklow beat Kilkenny 12-11 on Sunday 29 January to win their Round 1 tie in the 2017 Provincial Towns Cup and were eventually knocked out of the cup by Skerries RFC 2nd XV 23 – 11. Skerries made it to the final where they lost to Tullow RFC 20 – 3. You can find out more about the Provincial Towns Cup here. Read more of Are these the greatest Leinster Rugby Senior Schools Cup moments of all time?